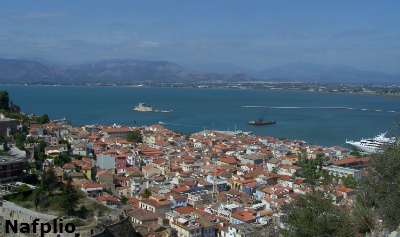 The photograph above is of Kyparissia Town taken from across the harbour. 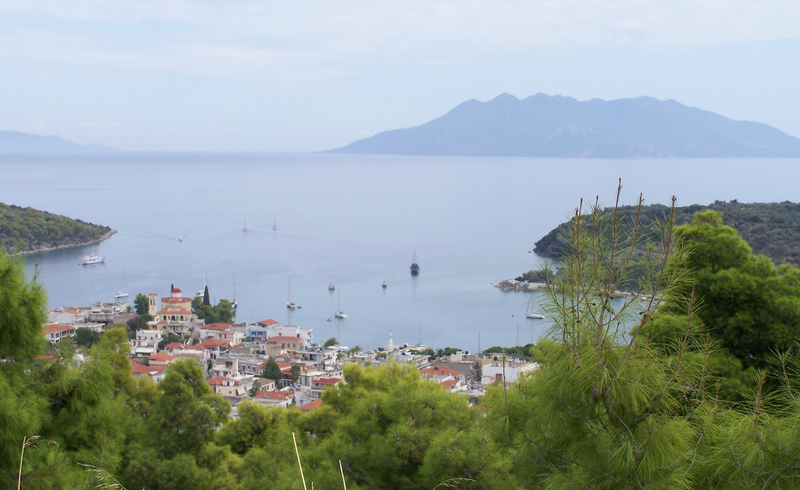 Kardamili is a small village on the coast of the Mani peninsular. The area is has many beautiful beaches. 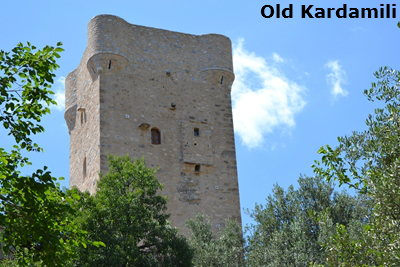 The skyline of Kardamyli, like many other Maniot towns and villages, is dominated by the distinctive regional architectural of the various towers built by the mediaeval aristocracy of the Mani. 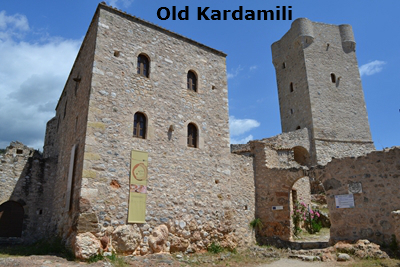 Kardamili is one of the oldest settlements in the Peloponnese, with its current name being mentioned in the Iliad, the epic poem by ancient Greek writer Homer. Many of the buildings of Old Kardamili, were built by the Venetians and feature a mix of traditional Greek and Venetian design. Many of the townspeople can trace their lineage back to either famed clans of the ares (as in the Mourtzinos and Troupakis clans), or the Byzantine Emperor Constantine Palaiologos, one of whose descendants (Dimitri Palaiologos) settled in the region. The descendants of Dimitris Palaiologos typically have the last same "Dimitreas", meaning "son of Dimitri'. Kardamyli is the departure point of many mountain trails, some of which lead to the peak of Mount Taygetus. Kardamili is known in the area for having an especially good view of Mount Taygetus, known locally as the "Profitis Ilias", literally translating to "Prophet Elias". Nearby is the Viros Gorge, with a total length of 20 km. The Viros Gorge remains bone dry in summer, however it is known to flood heavily in winter, when snow melts on the mountains and rain falls in heavy downpours. 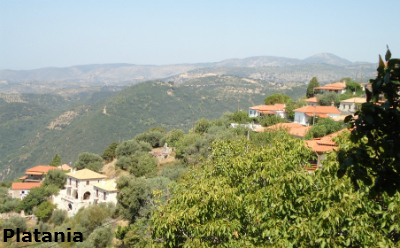 Karitena is a village in Arcadia, situated on a hill on the right bank of the river Alpheios, near its joining with the Lousios. 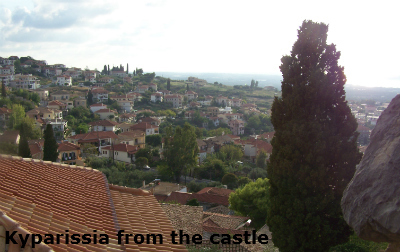 The village dates back to the Middle Ages, but its history is unknown before the Crusader conquest in 1205. The main sight of the village is the 13th-century Frankish castle, built at the top of the hill, with its highest point rising above the town. 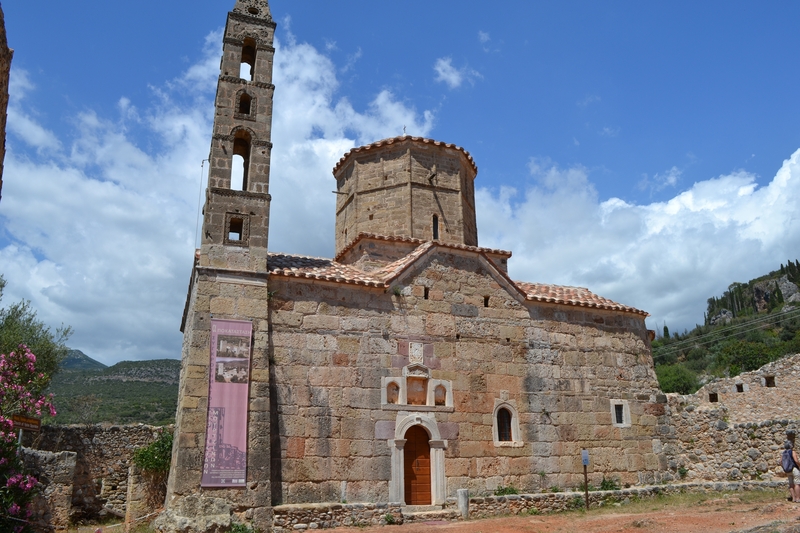 The castle was repaired by Kolokotronis, who erected a small church dedicated to the Virgin Mary, and built his house outside the walls. 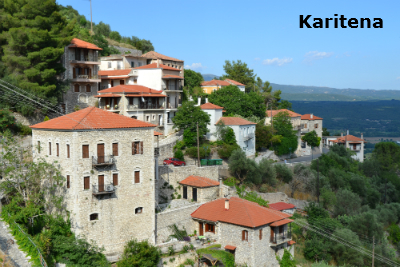 Karitena has been listed as a protected traditional settlement. Its unique townscape has earned it the nickname of the "Greek Toledo", and was depicted on the reverse of the Greek 5000 drachmas banknote in 1984 to 2001. 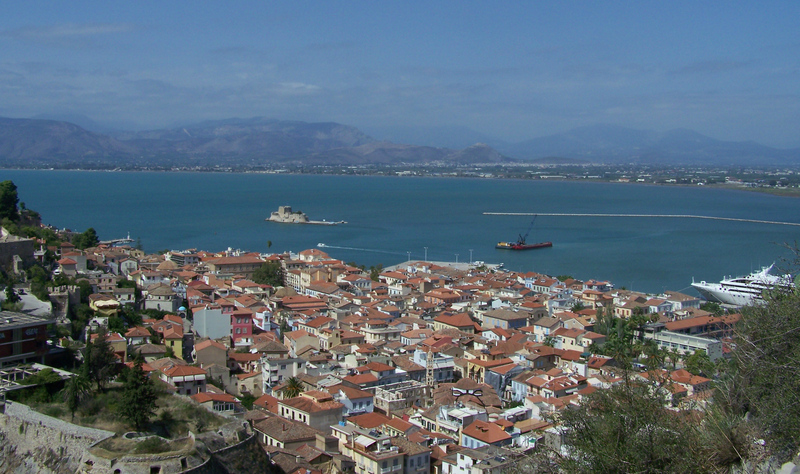 The town is situated on the Gulf of Kyparissia, a bay of the Ionian Sea in the west Peloponnese. The Greek National Road 9 (Pyrgos to Methoni) passes through the town. 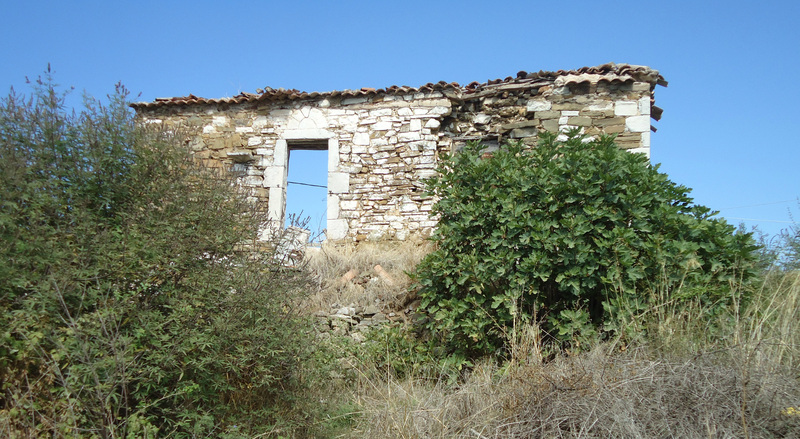 Kyparissia is the terminus of a now disused railway line from Kalo Nero, on the line from Pyrgos to Kalamata. The town has a port, which is mainly used for cargo purposes. 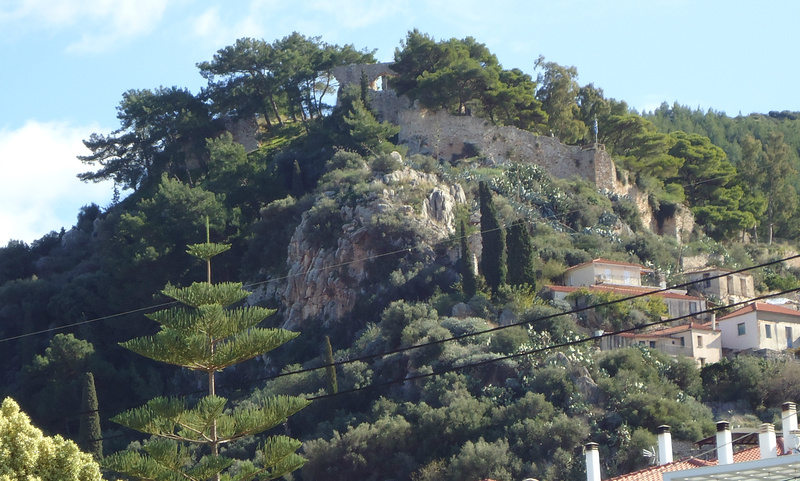 On a hill east of the town centre lies the fortress built during the Frankish period. Kyparissia has a wealth of beautiful churches, a wonderful beach, many shops and a busy square where there are lots of cafes where you can sit and enjoy a frappe!! In 1460 Kyparissia came under Ottoman control,with the exception of thirty years of Venetian rule, until the Greek War of Independence which began in 1821. Kyparissia continued to bear the name Arkadia till its destruction by Ibrahim Pasha in 1825, during the Greek War of Independence and when rebuilt it resumed its ancient name Cyparissia, by which it is now called. The second photograph was taken from Ancient Messene and shows how Ithome Mountain was severely burnt during a fire in August 2014. 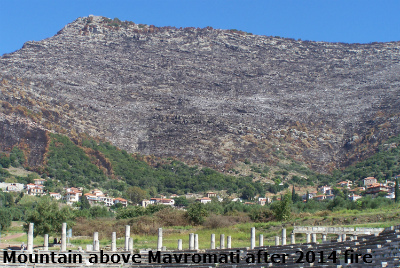 Mavromati as well as three other villages in the area were evacutated as the fire was very close to houses and even threatened the site of Ancient Messene. No injuries or burnt houses were reported but the blaze damaged forested areas and large areas of olive groves. Also in the village is Museum of Ancient Messini. 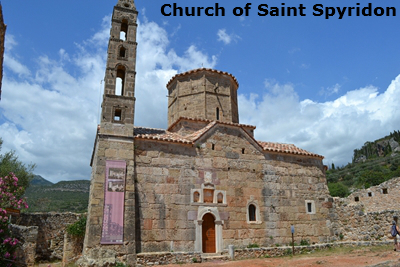 Sanctuary of Artemis Limnatis (Diana of the Lakes) is situated on the northeast of the village, on a plateau half way to the top of the Ithome Mountain, at the location known as "Spelouza". 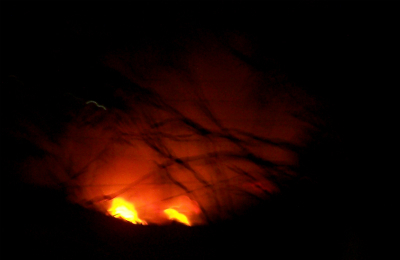 This is a photograph taken from the veranda of our house with the fire 15km away. It was burning most of a day, all night and into the following day. Thousands of acres of land were devastated. In all, some 90 firefighters, along with 38 firetrucks, countless volunteers and army personnel fought the fire. They were helped by water-bombing aircraft as well as several fire-fighting helicopters keeping the fire away from homes. This beautiful old town has a wealth of narrow alleyways and streets, steep stairs, taverns serving delicious Greek food, cafes, a lovely seafront promenade, and a beautiful walk from the harbour alongside the sea to the beach. 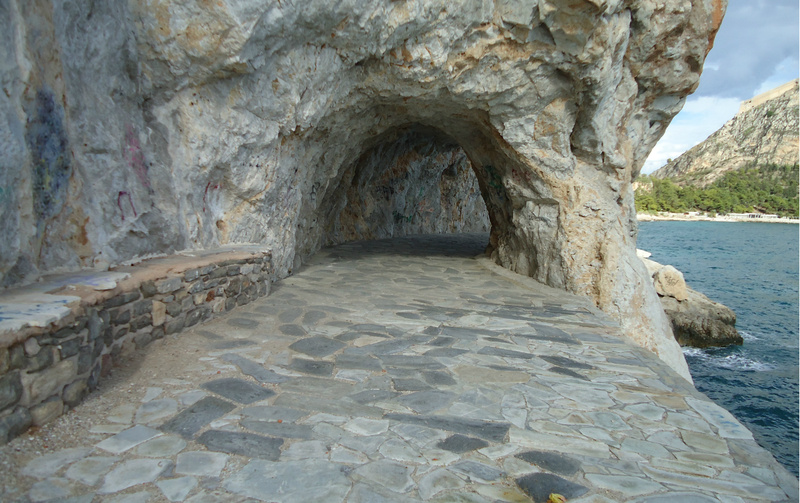 The Arvanitia walkway, one of the most popular walks in Nafplio, goes around Acronafplia which is close to the port. The stone-clad path looks up at the fortifications, the path winds itself along the edge of the sea and you can see the sparkling clear water below and wonderful views of the bay. Every once in a while, there are stone steps that lead down to the sea, either to a tiny flat that one could swim off or a rock outcropping for fishing and there are even seats along the walkway where you can sit a take in the sights and the smell of the pine trees. 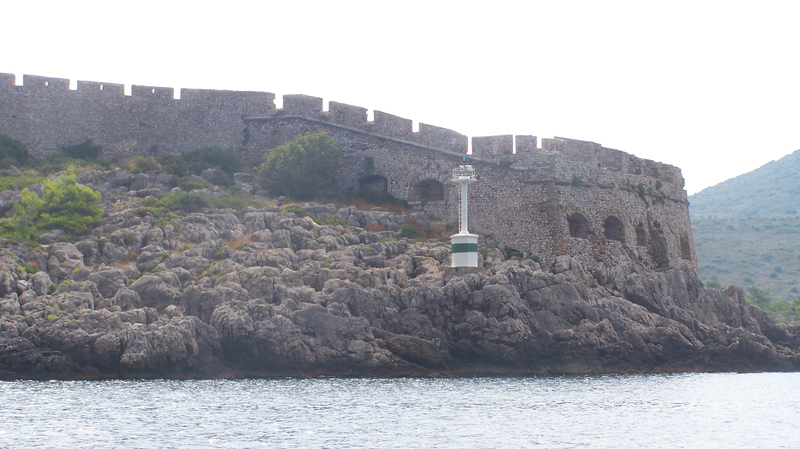 Gythio is in middle south of Peloponese at the centre of the Laconian Gulf. It is a lively, charming little harbour town. Most of the houses are two or three storey neo-classical mansions built on the steep side of Mount Koumaros. A long sea promenade, lots of tavernas with sea views, colourful fishing boats in the harbour, narrow streets and stairways all add up to a typical Greek sea-side town. Platania is a small village which stands above the gorge where the Neda river runs. From the village there is a small road through the village, (very scary) and then a dirt track that leads down to the beautiful Neda Waterfalls. The track can be very rough depending on what time of the year you use it. 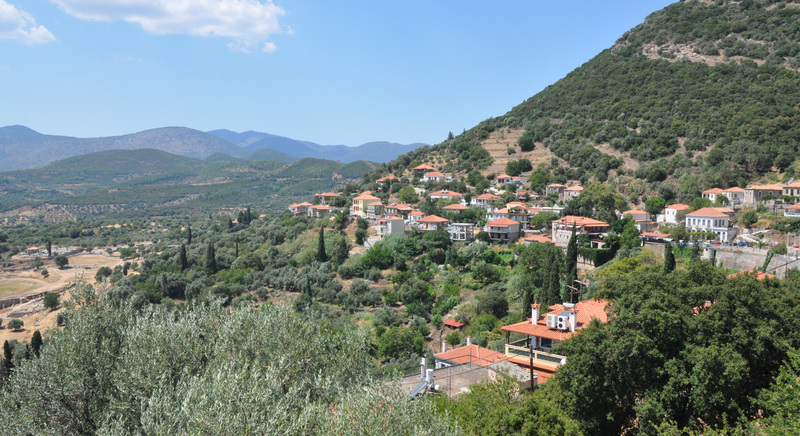 There are 2 or 3 very nice tavernas in the village with amazing views down the gorge and far away to the mountains. Just breathtaking! 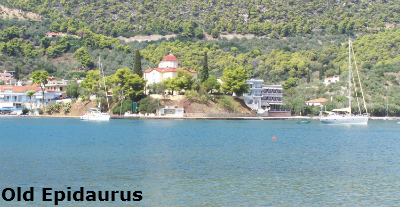 Old Epidaurus was one of the main cities of the Argolid and its prosperity goes back to antiquity. This was due to its strategic position, as it is placed among Corinth, Piraeus, Aegina, Trizina, Argos, and Nafplio. 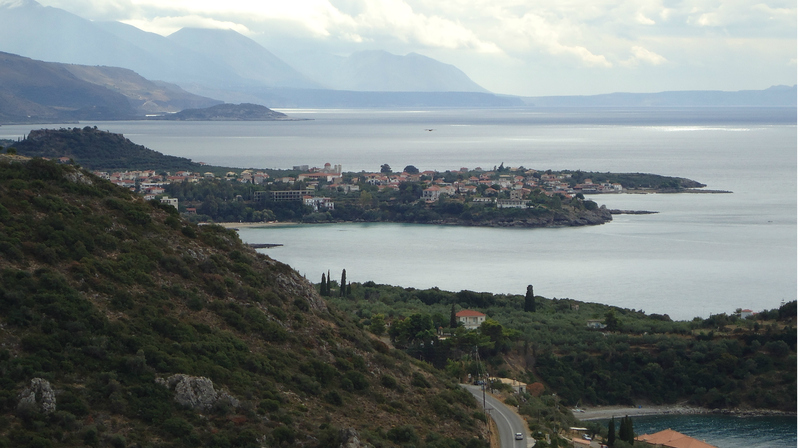 It was also the most important port of the Peloponnese Gulf. 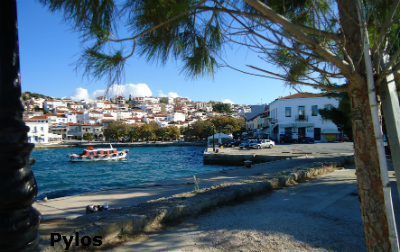 It is a small, calm and beautiful town on the coast of the Saronikos bay, at the edge of a plain with olive and orange trees. In its picturesque port, yachts and sailing boats tie up near the fishing boats. 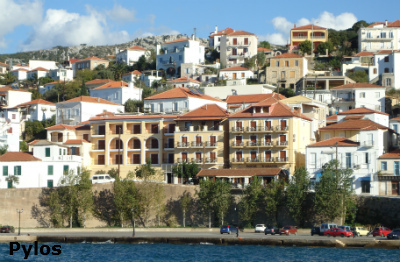 Along the quayside there are lots of beautiful hotels, tavernas, and cafes with lots of parking. North of the port is a nice beach. To the south stretches a long sandy beach with taverns and a camping site. The photograph to the left was taken from across the bay. As I was leaving Ancient Epidaurus I passed a large group of cyclists on the way. 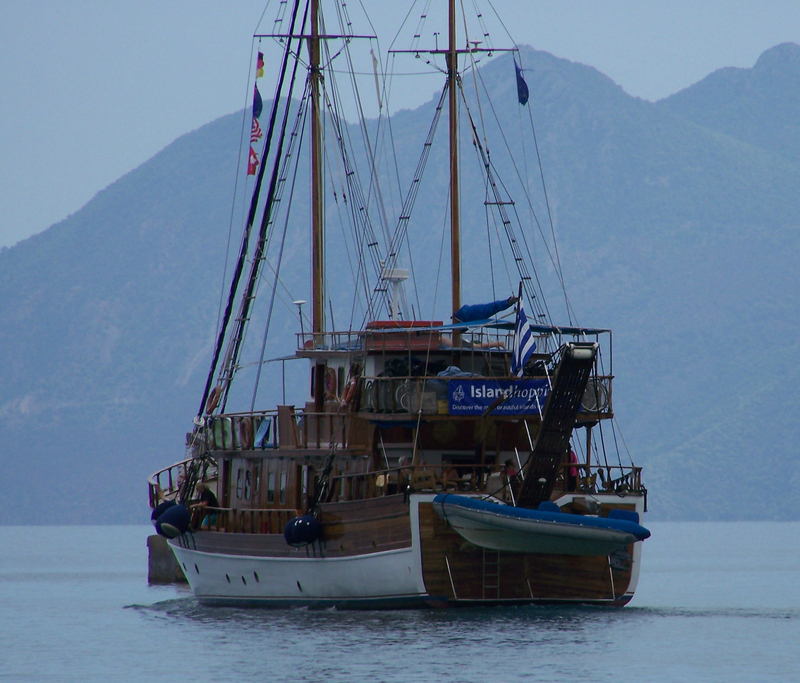 After I had been in Old Epidaurus for a while the cyclists arrived and boarded the wonderful little sailing ship pictured. Travelling by bicycle and on the two-masted motor sailer, Panagiota, they experience first-hand the cultural and scenic diversity of Greece. 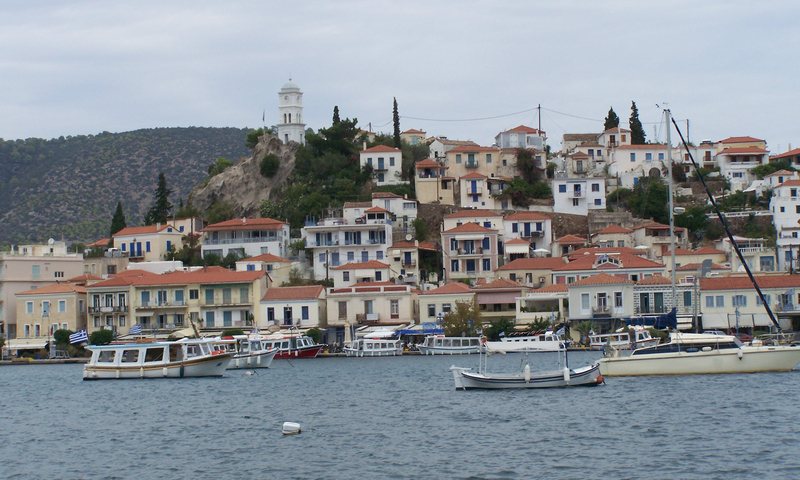 Travelling down the Saronic Gulf, a drive with amazing views, I arrived at a town called Galatas with the small Greek island of Poros across a 200 m wide sea channel. I travelled across in a small ferry which cost 1 euro each way. 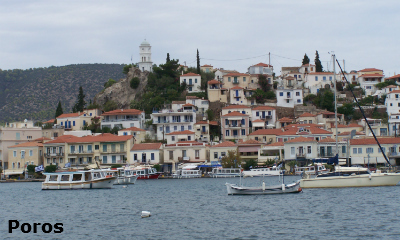 Poros consists of two islands: Sphairia the southern part, which is of volcanic origin, where today's city is located, and Kalaureia the northern and largest part. A bridge connects the two islands over a narrow strait. 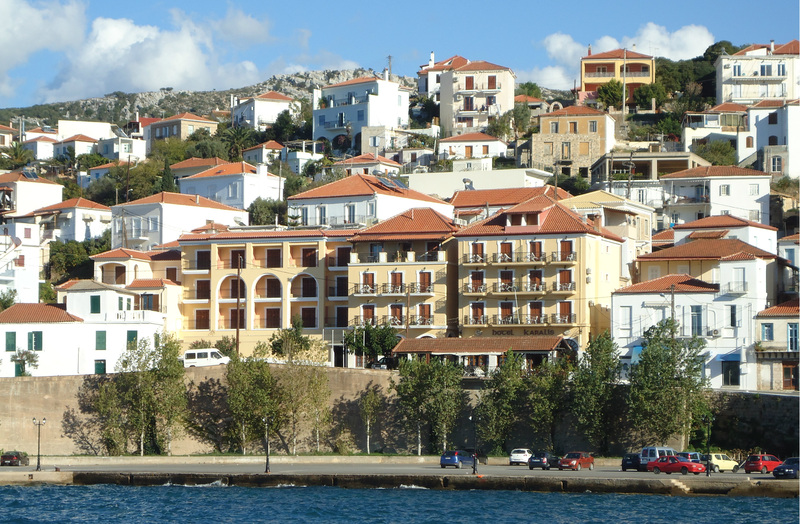 The modern city of Pylos is definitely one of the most attractive on the west coast of the Peloponnese . The little town is built like and amphitheatre between and on-top of two hills, on the southern side of the Navarino bay. 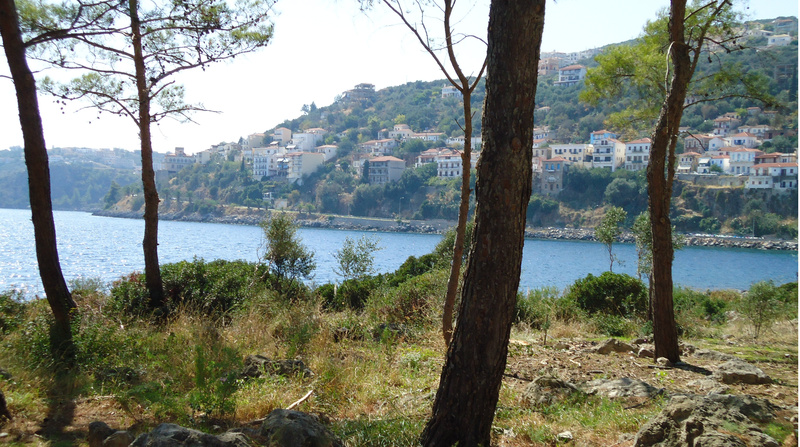 The charm of Pylos is due, mainly, to the following things. The main square and cafes are shaded by enormous centuries-old trees. Bordering the square the buildings and their arches are of colonial style. Memorials of the naval battle of Navarino, two cannon and a monument to the victorious admirals are located in the centre of the square. The fishing harbour and a marina which was built a few years ago. 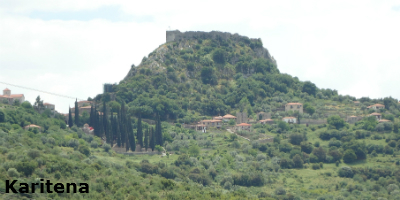 The fortress of Neokastro dominates the western side of the city. There is also a lovely little museum in the town. Facing Pylos and closing Navarino Bay, the island of Sphacteria is a huge natural barrier against the strong winds in the Ionian Sea and thus protects the Gulf of Pylos. 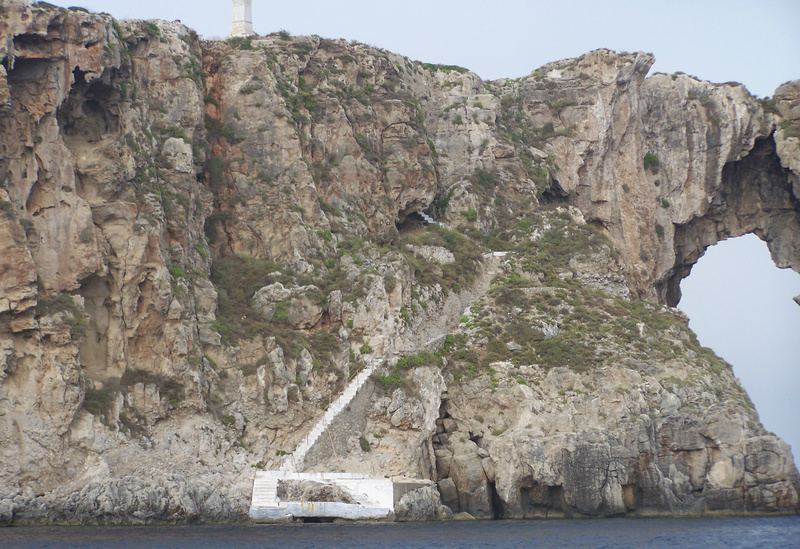 Only two narrow passages permit access in to the bay, at the southern end is the Great Thouri pass, near Pylos, and to the north, the Sykia pass near Voidokilia bay. During the summer, a trip by motor boat around Navarino Bay can be taken leaving the harbour of Pylos, tickets available at the kiosk on the harbour. 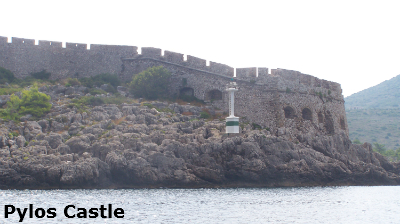 It allows you not only to admire the beauty of the islets and the main island, but also to visit the memorials and monuments of naval Navarino battle and the wrecks of ships sunk during the battle in 1827. In the centre of the Bay of Navarino is the island of Marathonisi or Chelonaki which in Greek means small turtle, on this island is the British Memorial from the Battle of Navarino. The naval Battle of Navarino was fought on 20 October 1827, during the Greek War of Independence (1821-32) in Navarino Bay. A combined Turkish and Egyptian armada was destroyed by a combined British, French and Russian naval force. 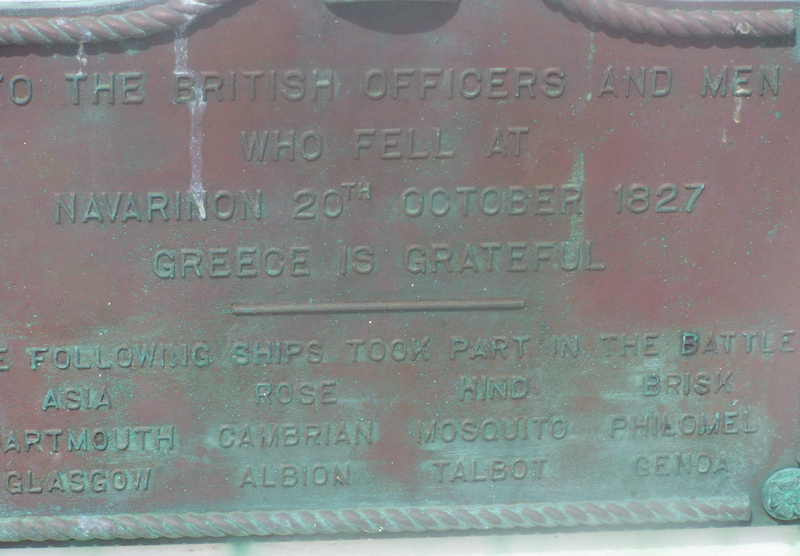 It is notable for being the last major naval battle in history to be fought entirely with sailing ships. The Allied ships were better armed than their Egyptian and Ottoman opponents and their crews were better trained, contributing to a complete victory even though they were greatly outnumbered. The sinking of the Turkish fleet was a turning point in the war. 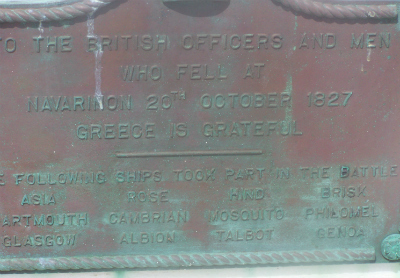 There are four memorials in different places in the bay, Russian, French, British and Greek. 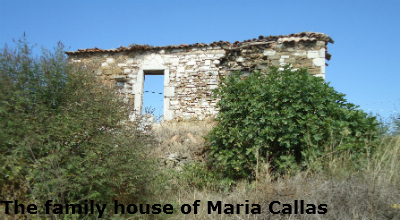 The photograph on the left is of the family house of Maria Callas in Neochori, near Meligalas, her father had a pharmacy in Meligalas. American opera singer Maria Callas was born Cecilia Sophia Anna Maria Kalogeropoulus on December 3, 1923, in New York City. Her parents, George and Evangelina, were Greek immigrants who shortened their last name to Callas once Maria started primary school..
On September 16, 1977, at the age of 55, Maria collapsed and died suddenly and mysteriously in her Paris home where she had become a recluse. 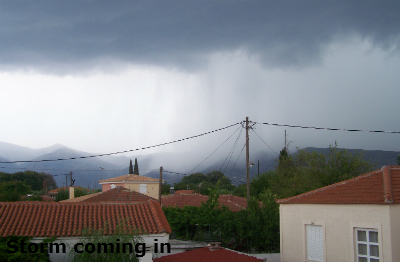 Here we have a storm coming in to our village. The photograph was taken from one of the verandas at the side of the house. 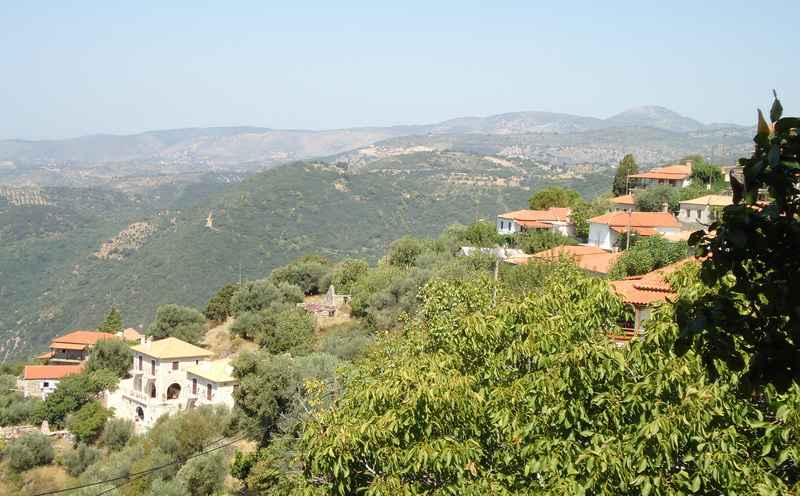 Where we live is a small agricultural village, in the Messinia basin, surrounded on 3 sides by mountains. 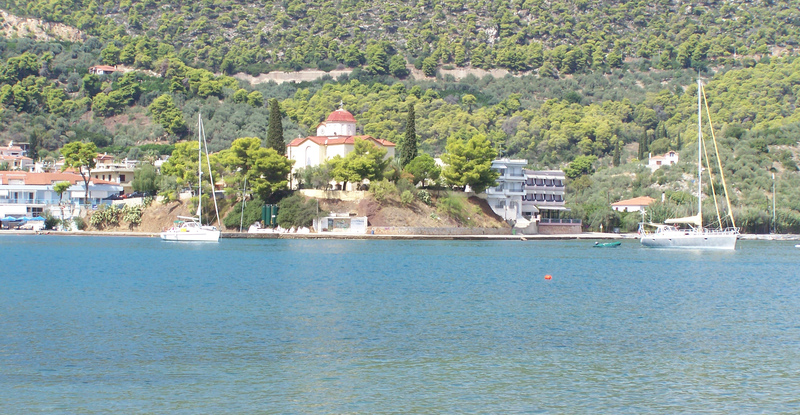 The area is renowned for its olives and the groves stretch for miles in all directions. 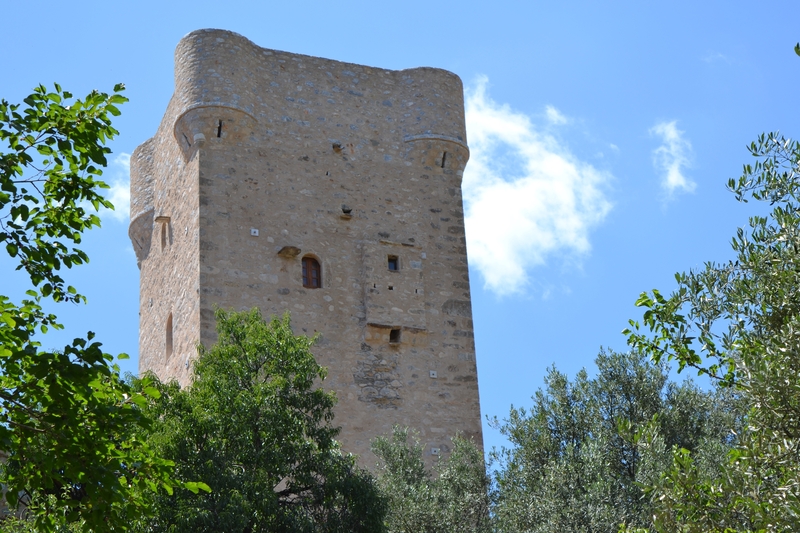 The olives are collected and pressed from November to February when the village is a hive of activity. In winter we have our regular residents but in July and August we have a large influx of people who come from Athens to their village houses for the summer. I understand the there was an Ancient Andania that existed as long ago as 2700BC. A local historian did find a grave near the river but, to date, no archaelogy has been carried out in the area, so the whereabouts of the ancient village is unknown.